Strip away the massive mechas, the enormous explosions and the larger than life characters and you’ll see that at its heart, Tengen Toppa Gurren Lagann (TTGL) is the traditional bildungsroman at both its simplest and its finest. The series follows two young men, Simon and Kamina as they fight to break free of their mundane lives in a post-apocalyptic underground village and discover what wonders the world above holds for them. It’s a story of how self-belief and friendship can conquer any odds but more than that it’s about breaking free not only of the limits we set for ourselves but those that others set for us. It is, by turn, stupid and silly, heart-breaking and touching but over and above, relentlessly entertaining and uplifting. It is, beyond a doubt, one of the best series in the last decade, and possibly one of the genre’s most complete stories. TTGL’s story doesn’t do anything new. The age old mould of a character emerging from his back-water province and being sucked into an adventure much larger than he ever imagined has been used in stories as dissimilar as Star Wars and Aladdin. Originality is not the series’ forte – many, though certainly not all, of its plot twists can be spotted well in advance. The story’s strength lies, instead, in creating an absurd world where nothing really makes sense and there seem to be almost no rules and then somehow getting its audience to care about what happens. There is no discernible point in the story where one is aware they have been hooked but somewhere along the way, what began as a goofy, silly journey against amusing opponents starts becoming slightly more serious until the big showdowns between the protagonists and the antagonists have a genuine tension to them and the stakes keeps rising right until the show’s end. The absurdity of the story never vanishes and the series’ charm does rely to some extent on its humour and its diehard commitment to being as over-the-top as possible but neither its flamboyance nor its ridiculousness overstay their welcome – when the story means business, you will know it. However, the story is only a smallest part, perhaps even the smallest part, of what makes TTGL an amazing anime. The majority of the series’ charm comes from the cast of lovable rogues from the shy and timid Simon, to the spunky Yoko but most of all to the flashy, larger-than-life embodiment of manliness, Kamina. The cast starts off small but expands in sudden flashes as the main trio encounter new characters yet the focus is always centred on the main protagonists, with an occasional glance thrown the way of more important secondary characters. As a bildungsroman, character development is guaranteed but it comes at a price as the characters will learn to their sorrow. Every step forward that the characters take is very much earned through blood, sweat and tears but conversely, the joy of watching those very same characters overcome the obstacles that once held them back is easily the greatest part about watching TTGL. Hard as it is to believe, TTGL is produced by the same animation studio that created the famous (infamous?) Neon Genesis Evangelion with TTGL’s director, Hiroyuki Imaishi, previously serving as Evangelion’s key animator. However, the similarities end there – the two anime are both ostensibly about mecha but couldn’t be more different in their tone. TTGL is best seen as deconstruction of the genre of ‘serious mecha’ created by Evangelion with the latter’s serious depiction of war-time violence and its psychological effects being flipped on its head in TTGL and re-examined from a less insane and pessimistic angle. 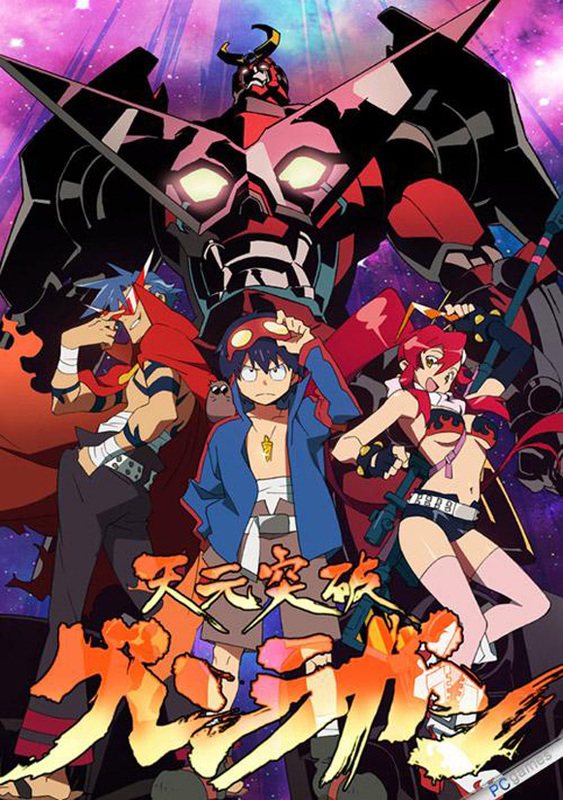 Apart from that, TTGL continues to enjoy and suffer from the same quality production that its famous predecessor did – while the last four episodes or so had incredible production value, its initial set of episodes suffered from lower budgets. The opening set of episodes had a goofy, simplistic art style that was fitting for the series’ light-hearted humour but while it wasn’t noticeable from episode to episode, the art style did shift substantially to a somewhat more detailed and serious form in the show’s second half in accordance with its more sombre nature. The series’ OST is nothing short of incredible either – with an opening (‘Sorairo Days’) that becomes more relevant as the show goes on and some great background tracks like ‘Libera me from hell’ that plays in the show’s best scenes. This is not a show for those looking for a serious outing, where everything is logical and makes perfect sense. This is a show whose plot is enslaved by its dedication to over-the-top moments and badassery – come to Tengen Toppa Gurren Lagann expecting nothing but crazy, nonsensical entertainment and you won’t be disappointed. This is not Evangelion Lite nor is it some silly Saturday morning just for the kids; the story and the characters will grip you tightly and you won’t even realize it until it’s far too late.